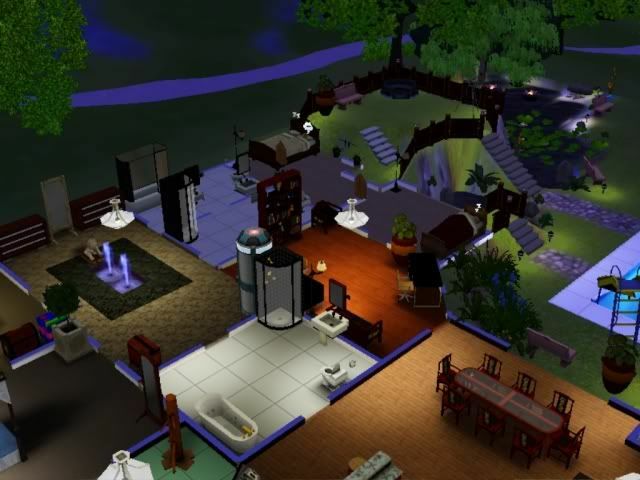 I'm really particular about symmetry when building my homes in Sims 3. I also almost never build second or third floors cause I hate having to move up and down to see what my Sims are doing! I'm the kind of player that seeks achieved lives for my Sims. None of them are allowed to wreak havoc and all excel at school/work. I never create Sims based on real-life people cause I just find that... weird. Perfect symmetry of my pool+fountain! Mini-fountain inside the house too cause I like water features. But to be honest the interior of the house doesn't interest me much. I prefer working on the exterior! Everything here is painstakingly landscaped, down to the small hills/irregularities in terrain and even the colour of the "cliffs" on the left. After seeing the final result Alaric has grudgingly admitted that I should design our home in the future (or I like to believe he thinks so). So anyway if one day you drive around Singapore and happen to see a home that looks like this... it means the person read my blog and copied me. 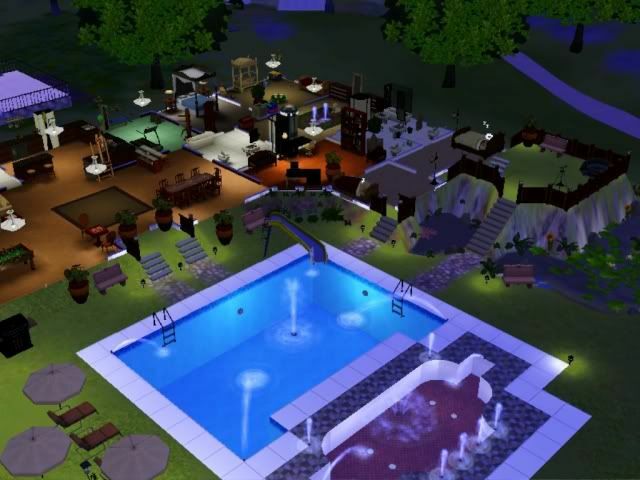 20 comments on "My Home"
you've just ignited my desire to start playing sims again. very nice home you've got there!! Anonymous: Lol I forgot to take a screenshot of it with the roof. When you're playing you gotta change to roof-less view! 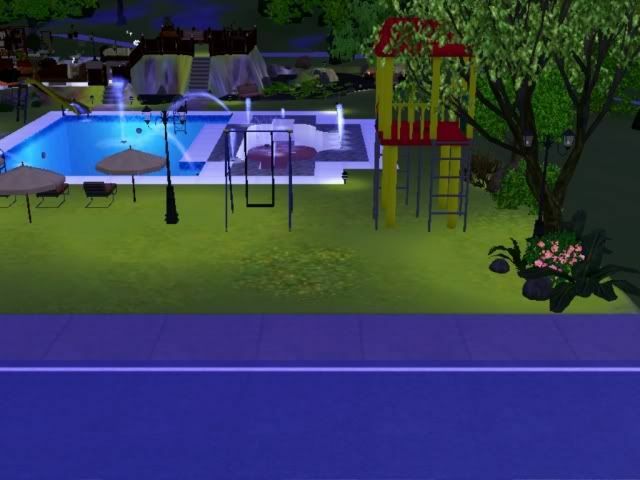 bisque: Haha I love Sims! Do you have any expansion packs? anyways, i think http://www.thesims3.com/game/sp3/videos will totally suit you! haha niceee maybe you should take a second degree in interior design! do you play other games such as city story or farm story or zombie cafe, too? Do you hv any idea how to create a curved pool? I don't! Sims is hands down my fav game ever. But I can never have enough patience to do the terrain and stuff! YAY I JUST GOT WORLD ADVENTURES. ITS FUN!!! 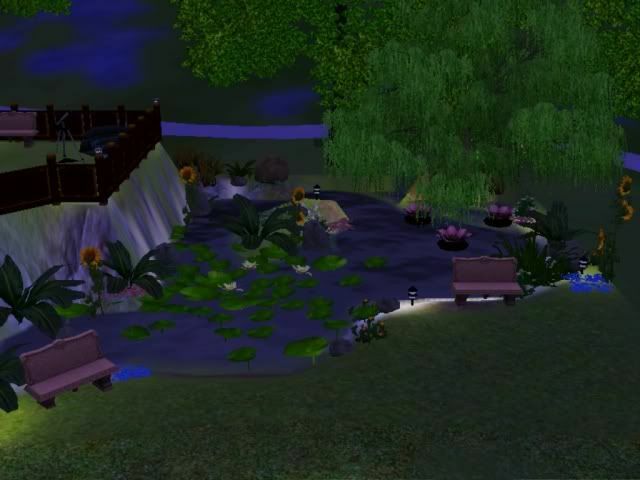 omg your house landscaping is amazing! haha i used to be the opposite.. i worked a lot on the interior but ignored the exterior. this makes me miss the game so much!! Hayley: Haha what's that expansion about? Like just focus more on careers is it? And no I only play Farmville haha but i landscape there too! Anonymous: It's just one of the options in the game leh. Like instead of a square pool plot, they give you a quadrant and you can rotate it. Anonymous: Yeah I spent like 3 hours building this from the ground! I just do it occasionally when I get bored with the home. Anonymous: Haha yah! I like the tombs and can learn martial arts! Anonymous: Haha why your bf can restrict you on smth as bohliao as expansion packs?? But yeah quite pricey I think Sims3 itself was $70/$80 and one expansion pack like $40? I can't rotate the quadrant that's the thing! Anonymous: If I'm not wrong you can press < or > to rotate. yeah designing the house was always my favourite bit. then it was getting them to get more and more bfs/gfs.... wooppeedoodah. 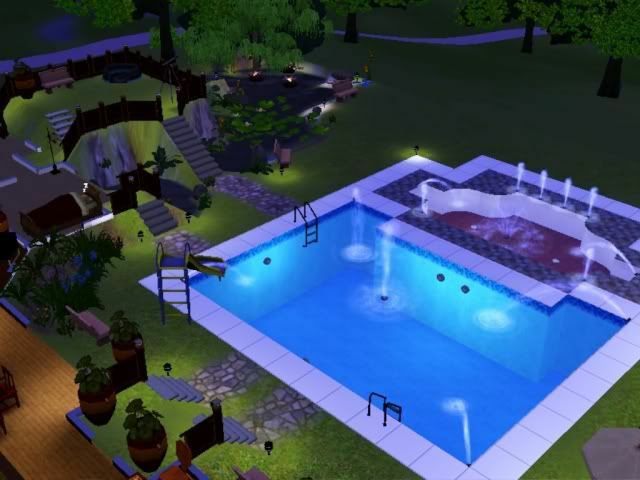 What expansion pack did you use to get the water slide and the fountain outside? Am a bit slow but this AMAZING! For the fountain you can just go to the pool/water tools under Build. Now you can build quarter circles instead of full squares for the pool, then you can wallpaper + tile the "pool" to make it look like a fountain. The fountain sprays are under Build too.